Noting the benefits of having a single securing bracket for simplicity of being able to remove the camshaft plus acting as an oil splash back, Vintage MG Parts decided to develop their J Type design for use on the F Type engine. 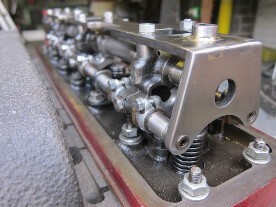 Unlike the J Type and later models where the rocker shafts are supported at the rear of the cylinder head, the F shafts at the rear of the engine for rocker fingers 11 and 12 are left floating. It was therfore considered as a neat modification to extend the plate with a 90 degree drop at the rear to provide more strength to the shafts by supporting them. These are made to order only as they are a little time consuming and tedious to make! 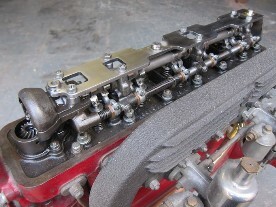 Several are now on customer's engines, including one on a Wolseley engine although for the latter application, a steel spacer ring and 3 separate rocker knob spacing washers are required which we can also supply.